What do you give the person who has just about everything? I come upon this question all too frequently around gift giving occasions. Not because my family members are difficult to please, but rather because I just don't want to give them more 'stuff'. I find this particularly difficult with the guys of the family. I usually rely on my husband for 'guy ideas' - tools, bike stuff, gadgets etc. - stuff they will like and actually use. But every year there is one person that stumps us both. This year it was our brother-in-law. When we really get stumped we seem to explore 'experience gifts' (e.g. tickets to a game) or something handmade that will (hopefully) encourage fun experiences. After much brainstorming, online shopping (I have a toddler, gift shopping now rarely happens in stores), and reflection on their life/interests, I had an idea. Now my sister and brother-in-law live in London with their two adorable dogs, Shirley and Frau. Last summer they generously invited us (and our 15 mo old at the time) to come visit in Oxford and London. They even put up with us and an overstimulated baby for two full weeks. We had ridiculously good weather while there and spent our days going on walks, exploring parks, and relaxing. I love London. I particularly love Green Park. Some of my best memories of London take place in parks. And though I have had sunny skies both times I have visited, rumor has it they have frequent rain. Where am I going with this? 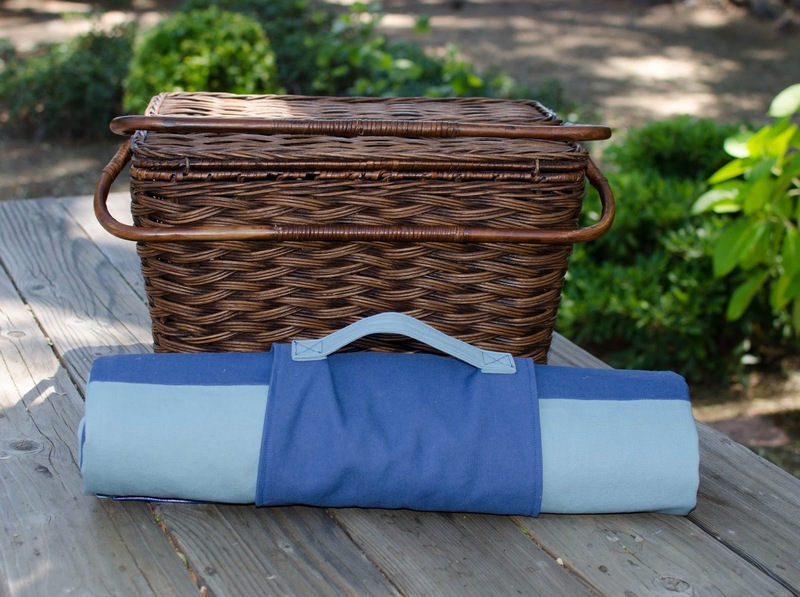 Well, I decided to make them a picnic blanket. 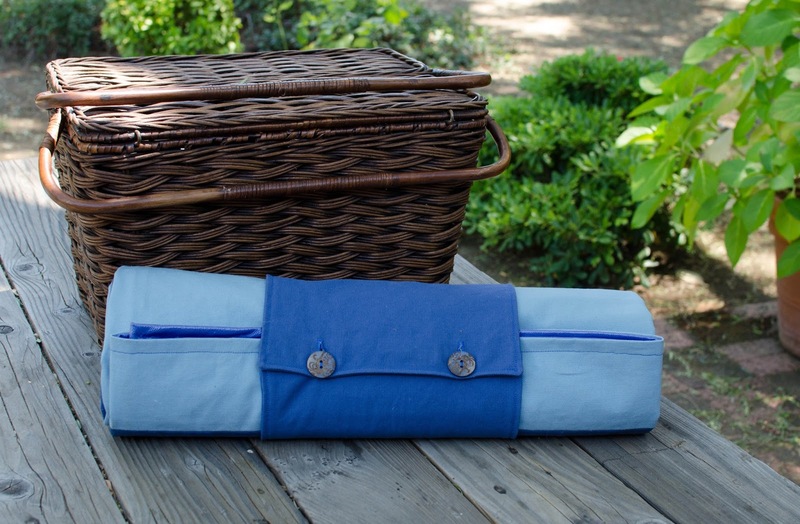 A waterproof (rain = wet ground) and washable (dogs+parks+wet ground = mud) picnic blanket. 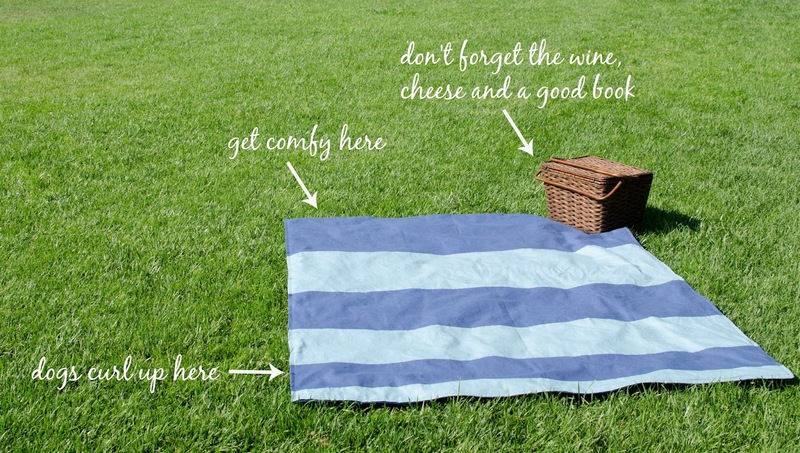 Now sure you can buy picnic blankets and some of them are really great. I happen to love mine that was purchased for us as a wedding gift almost 6 years ago. And that is where I started, but I just couldn't find one within our price range that seemed to fit their personality. Now by this time it was getting really close to Christmas and I was kind of freaking out. So I did what I really hate to do...I gave the 'promise' of a custom picnic blanket as his gift. And this apparently turned in to a long term promise as it is now July and I have just finished the gift. Do I feel horrible! Well, hopefully it was worth the wait! After much searching in fabric stores, I could not seem to find the right combination of pattern, color, and durability. So I grabbed two compatible blue colors of Canvas Duck Cloth and set out to make a sufficiently gender neutral custom stripe pattern. And, of course, this would be no simple stripe pattern of equal widths, but a gradient of widths and alternating colors. After a little math, I settled finished blanket dimensions of the full width of the fabric (approximately 60") x 84" (7 feet or 2 1/3 yards). (Apologies in advance for mixing inches, feet, and yards together in my measurement denotations below.) This length worked perfectly for stripe widths starting at 4" and incrementing by 4" up to 24". Pre-wash all fabrics and dry according to fabric care instructions. To end up with finished stripe dimensions of 24", 20", 16", 12", 8", and 4" you will need to account for seam allowances (1/2" used here) and cut canvas strips of 25", 21", 17", 13", 9", and 5". Remember the second dimension of the strips in each case is the full width of the fabric (around 60"). The canvas color that you have 51" of will be cut into strips of 25", 17", and 9". Likewise, the canvas color that you have 39" of will be cut into strips of 21", 13", and 5". The PUL should be cut to a length of 85". First place all stripes next to each other on the floor in the order they will be sewn with right sides up. Start assembling the canvas stripes in pairs. First, place the right sides together of the 25" and 21" stripes and pin along the joining side. Repeat for the 17" and 13" pair, and the 9" and the 5" pair. Sew each pair along the pinned edge with a 1/2" seam allowance. You will then have three sewn pairs. Again lie all three pieces on the floor as they will be assembled in the final blanket. Pin the 25"/21" pair to the 17"/13" pair along the joining side with right sides together. Sew along the pinned edge with a 1/2" seam allowance. Again lay the pieces on the floor and pin the final 9"/5" pair to the rest of the blanket along the final joining side with right sides together. Sew along the pinned side with a 1/2" seam allowance. The canvas stripes should now be fully assembled into the top of the blanket! 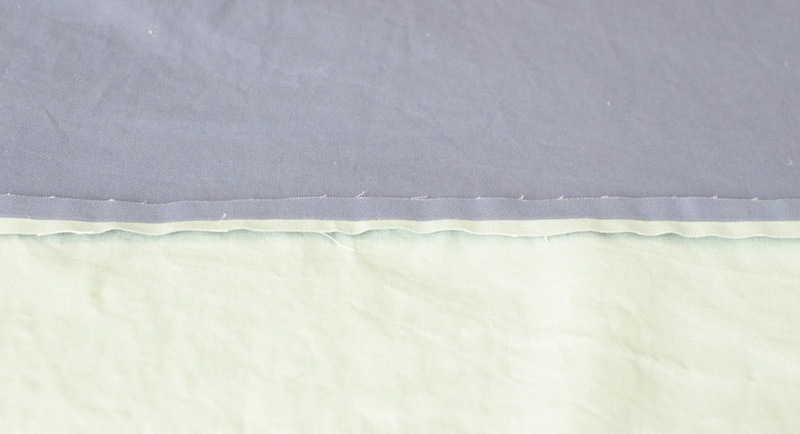 Press the seams flat (open) on the wrong side of the blanket (shown below) and iron any wrinkles or creases in the canvas. 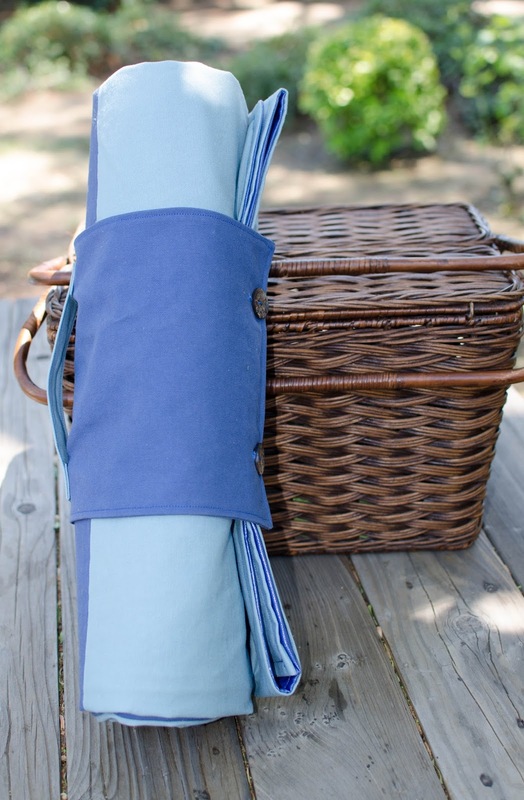 Once attached to the PUL, you will not be able to iron the blanket without damaging the PUL. Next lay the PUL shiny side up on the floor. 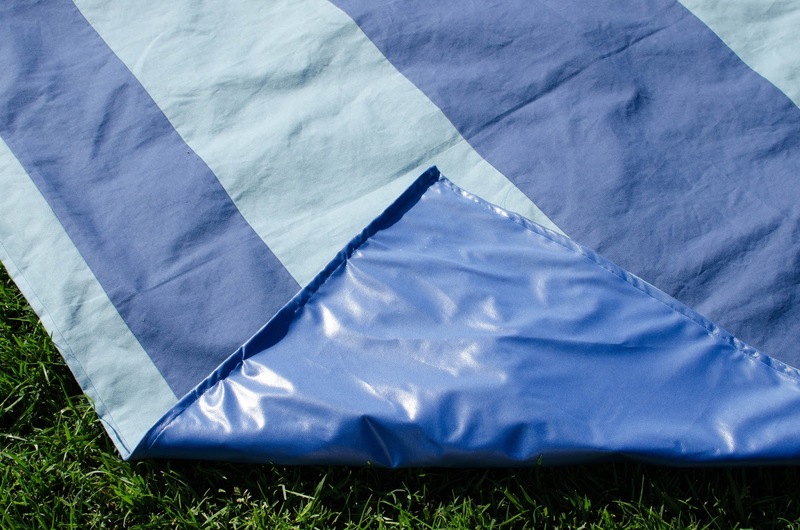 Place the striped blanket (right side down) on top of the shiny side of the PUL. In other words the two right sides of the fabric should be facing each other (together). Remember you will want to minimize pinning because you are poking holes in the waterproof layer. Also, the PUL will stretch slightly in one direction as you sew. To accommodate for this, I lightened up the pressure on the presser foot and pinned/sewed one side at a time. I also would suggest sewing down both sides and across the top and bottom in the same direction (e.g. left to right) instead of in a continuous line around the blanket to prevent twisting due to stretching in different directions. Start by pinning (sparingly) along the top side of the blanket. Sew along the pinned side with a 1/2" seam allowance and stop (backstitching at both ends). Once I completed this, I only noticed about 1/4" of stretching with my PUL which wasn't too bad. Next pin along the length of the blanket and sew. Then pin down the other long side of the blanket and sew. Finally, pin and sew the bottom of the blanket in the same direction as the top, leaving about 18" open in the center of this side. This gap will allow be used to turn the blanket right side out and will be closed upon topstitching. Cut the corners of the blanket which will make for cleaner corners upon turning right side out. Be careful not to nip the seams. Turn the blanket right side out. Remember do not press the blanket. Instead, straighten the blanket, push the corners out fully (I use a point turner), and make sure the edges are fully laid out and ready for topstitching. Fold and pin the open section to match the rest of the blanket. I did also pin the edges of the blanket on all sides (sparingly) to make sure the edges stayed fully laid out and straight. Top stitch around the entire blanket 1/4" from the edge. I did complete this in one continuous seam all the way around the blanket. Pay particular attention to the area that had been left open, making sure the top stitching catches the folded fabric and seals the blanket fully. Voila, the blanket is complete! 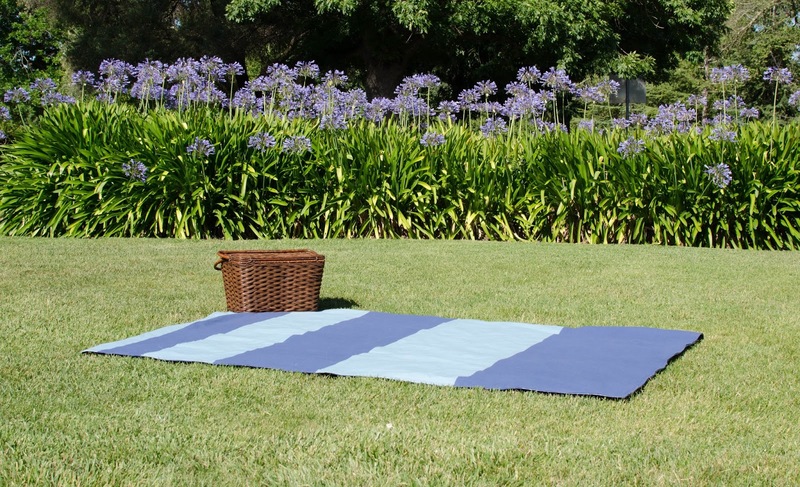 However, carrying a large blanket to and from a park can be a bit frustrating if there is no way to keep it all together. As this gift was already 7! months late, I figured I would go the extra mile and make a matching blanket wrap with handle. 2 pieces of canvas fabric 11" x 21"
1 strip of canvas 3 1/2" x 10"
To determine the dimensions of the wrap, I folded the finished picnic blanket in thirds the long way and rolled it up. Then I measured the width and circumference. I settled on finished dimensions of the wrap to be 10" x 20" (plus 1/2" seam allowances on all sides), hence the two 11" x 21" rectangles of canvas. For construction of the wrap, you can think of the wrap as if it were a tiny blanket. First, pin the two pieces of fabric with the right sides together and stitch around the edge of the blanket with a 1/2" seam allowance, leaving a few inches open on one of the sides. Snip the corners and turn the blanket right side out through the open seam. Press the corners out fully and iron flat. Fold the fabric at the open section to match the rest of the seam and pin together. Topstitch around the border of the wrap 1/4" from the edge, again making sure that the area left open is caught and sealed by the topstitch. 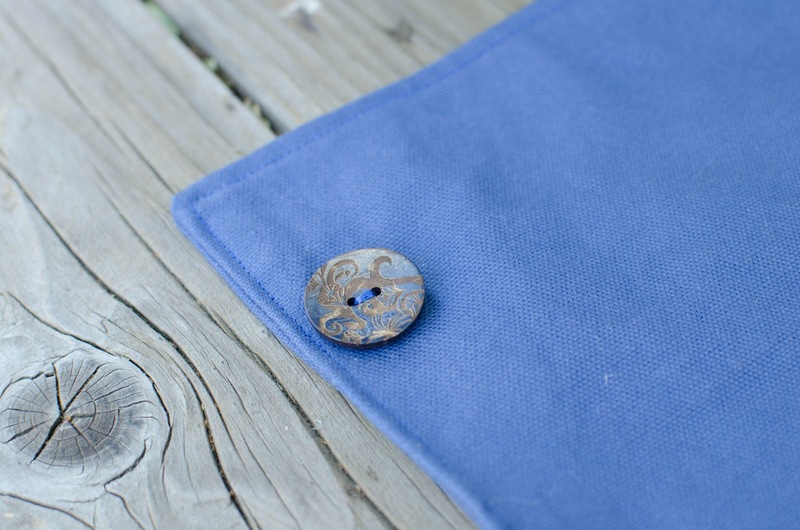 Now find your two 1" buttons and place them approximately 3 inches from edges of the long side of the wrap and about an inch in from the edge of the short side. Sew the buttons to the wrap. Next mark the locations of the button holes. When folded up in thirds lengthwise and rolled, my blanket measured approximately 18" in circumference. This meant that I needed the center point of my buttons to be 18" from the outermost end of the button hole. Sew the button holes and cut the center open. Test the buttons and fit around the blanket. And finally, it is time to make the handle. 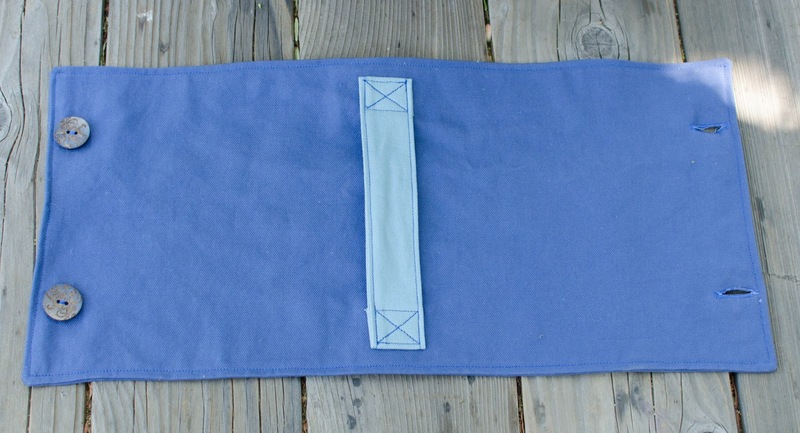 With a desired handle dimension of 1.5" x 8", you will need a 3.5" x 10" strip of fabric. Fold the strip in half lengthwise (right sides together) and sew along the long open side. Turn the 'tube' you have just created inside out and press with an iron. Top stitch along both long sides 1/8" from the edge to create a finished look. At both ends of the handle, fold under 1" of the handle and press a crease. Position the handle where you want it on the wrap (I did mine in the middle) and pin it in place, making sure the 1" portions on each side are folded under. Where the handle overlaps the 1" portions on each end of the handle, sew a box around the overlapping parts and an x across the center of the box for stability. Now I kind of want to make these blankets for everyone. I think they would make spectacular wedding gifts, bridal shower gifts, birthday gifts...you get the idea. 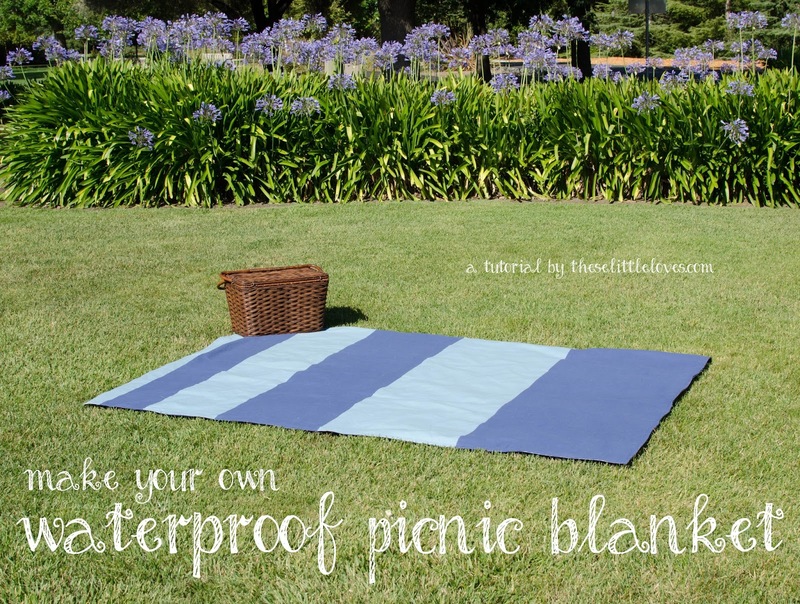 If I didn't already have a picnic blanket I would make myself one too! I love this! A wonderful idea and it turned out beautifully. Thanks Jacque! Maybe sometime I can make y'all one:).